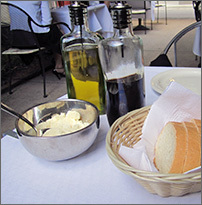 Angelina's Green Bay, WI believes Italian dining truly is an art form. Every meal is made from scratch, using only the finest ingredients. A dinner consists of several courses spread out over a period of time. Nothing is rushed. Sitting down for a meal is the time for family to gather, enjoy the cuisine and share their feelings. Angelina was born and raised in Italy. She came to live in America in 1993 and she was surprised by what Americans considered to be Italian food. Her skills as a cook, her love for her homeland dishes, and her eagerness to share her talents are what inspired her to start this business. With great pleasure, Angelina presents fine Italian cuisine. We always go to Angelina's when we are in town. Awesome, fresh food, served with a smile. Don't forget to look at the specials, she always has something yummy going on! I lived in Italy for a year, and I haven't tasted anything as authentically delicious in the U.S. as the food at Angelina. The patio is GORGEOUS, I had the Spaghetti alla Putenesca, delicious! Highly recommend! Great downtown location, could not wait to enter! Felt like I found a little , off the path, & hot spot in NYC or Kiev, Ukraine. Nice atmosphere, very clean but...disappointed mostly. We had to wait for a waitress staff member to appear out of the serving area to seat us. They had no clue we were there since they were busy chatting to each other which, we could hear. After standing by the bar for a few minutes listening, we decide to hang our coats. So allowed us to view the chatter too! Lucky us!! So, kind of turned us off. Now seated , we were asked for our drink orders and food orders just minutes after, so that was in a timely fashion. Now, Angelina's is winning points back. To again disappoint us with cheese raviolis and spaghetti and meatballs with no flavor. The bread was dried out on top, perhaps sitting out to long under a linen napkin?? So, it was just okay for our first experience. Would go back, but will not crave Angelina's. Sorry.... but please take my criticism as a tool because I really feel like Angelia's is a diamond in the rough! We went to Angelina's for our 27th wedding anniversary. Everything was perfect and romantic. The wine list had some great Italian wines and they allowed us to sample them before ordering a bottle. The authentic Italian food was to die for. The wine was outstanding and the service was very prompt and courteous. One of the owners (Ermanno) even came out to personally greet us and treated us like family. I would highly recommend this place to anyone who wants a great authentic Italian meal and experience. My wife and I walked in without a reservation and asked if we could sit outside. (which was still under construction, its beautiful now and it will be perfect when its done.) Perfect for a bottle of wine with the mrs. or great for a quiet cocktail and a cigar with a buddy. My wife said she felt like a queen, after the way we were taken care of. Every employee has a smile, you know, the one from the heart. I would recomend the lobster ravioli to the good lord himself. It was cooked to perfection and the taste was ... well words just won't do it justice. Go try it. With beer, wine, appatizers, two meals, and salads. The bill was very reasonable. A quick thanks to the wonderful employees who helped make our anniversary perfect. We travel from Los Angeles to attend the Packer game each year. For the past three years we have always gone to Angelinas for Dinner when we arrive. Not only is this the best Italian food in Green Bay, it also ranks among the best that Los Angeles offers. The gnocci is to die for. The waitstaff and owners are gracious and welcoming. I can't wat to be there this Saturday night. Angelina’s is an Italian restaurant located in downtown Green Bay. The restaurant is run and owned by an Italian family from Sicily, Italy. All their sauces and family recipes are made in house. I stopped in for lunch and since it was a beautiful weather day, I chose to sit on their outside patio, which is located behind the restaurant. Their patio is quite charming. 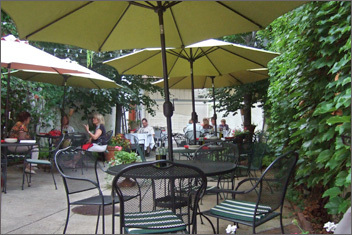 The patio’s atmosphere gives off the feel of walking into a café in Italy. There are pretty floral planters and ivy growing everywhere. My server brought me a menu and told me of the lunch specials for that day. I chose a Panini meatball sandwich which comes with a small salad for $11.00. My server brought my beverage and also brought out sliced bread with fresh parmesan cheese, balsamic vinegar and olive oil. As I waited for my sandwich I enjoyed my peaceful surroundings with music playing in the background. After a time, my salad was brought out first. 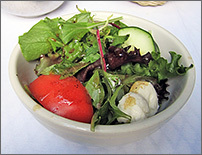 It consisted of fresh mixed greens, small fresh mozzarella balls, cucumbers and tomatoes mixed with delicious light homemade vinaigrette dressing. After I finished with my salad, I was then brought out my sandwich. 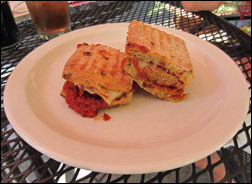 The sandwich consisted of two homemade very large meatballs, spread with their in-house made sauce and melted fontina cheese, all inside a toasted multi grain ciabatta bread. The Panini sandwich had such a delicious savory flavor that I wish I had more to take home with me! I then ordered dessert; a dish of pistachio gelato for $6.00. 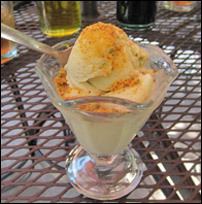 The gelato consisted of two scoops with fresh shaved pistachio nuts sprinkled on top. The gelato was delicious and of good color and quality; for I have had my share of gelatos when I vacationed in Florence and Rome, Italy. Angelina’s also serves dinners and have a wonderful wine list and full bar. I went to dine on some authentic Italian cuisine at Angelina Restaurant which is located in downtown Green Bay. As you walk in there is a scattering of personal photos of Angelina's family and pictures of Italy hanging on the walls. There are two large picture windows in the front with the original hardwood floors, and a quaint small lounge bar area towards the right back side of the restaurant. 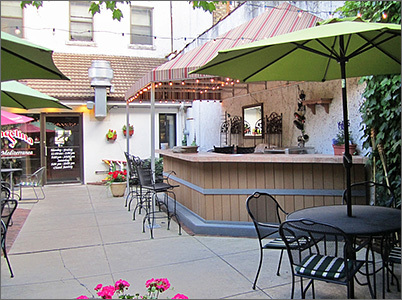 As you continue to walk through the back of the restaurant there is a picturesque small patio for outside dining. On the patio there is a larger bar with a striped awning overhanging the counter. There is also some beautiful ivy growing on both sides of the walls, various urns and pots overflowing with flowers, a nice shade garden tree, and tiny white lights that are strung up. A few tiki torches are placed throughout. There are large sized wrought iron round tables with umbrellas and smaller iron tables with linen tablecloths that seat two people. My server was very polite and prompt. He gave me the menu which also contains their wine and beverage list, brought out ice water, and told me the day's specials. My choice for that evening was their Pollo Al Marsala for $18.95 which includes a fresh garden salad. As I was relaxing and waiting for my dinner I was embracing the lovely atmosphere when I heard church bells ringing from a nearby church. The bells brought back happy memories of vacationing in Italy. Next two carafes were brought out to my table, one contained olive oil and the other contained balsamic vinegar. A small dish of freshly grated parmesan cheese and a small sliced loaf of fresh bread in a basket lined with a linen napkin were also brought out. My appetite was steadily increasing from the wonderful aromas that came wafting towards me from the various entrees being served to the other nearby diners. 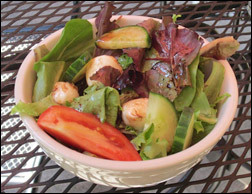 The salad came out and it contained a fresh mixture of dark greens with a tomato wedge, two fresh mozzarella balls, and two thick slices of cucumber with a balsamic vinaigrette dressing tossed into the salad. The salad dressing tasted wonderful, it was so fresh with such a burst of flavor. Angelina Restaurant is noted for making all their sauces and dressings in house. Next came the main entrée, Pollo Al Marsala, which contained two large chicken breasts floured and sauteed with Portobello mushrooms with a splash of Marsala wine. The dish tasted amazing. 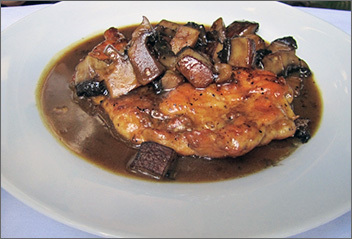 The chicken breasts were sauteed to a light brown outside with a tender and moist interior. The chicken was covered in this delicious sauce with a serving of chopped Portobello mushrooms; it was a magical combination. One heads up, make sure you make reservations for Angelina Restaurant, they book up fast especially on the weekends. This summer is breezing by so fast, I can hardly believe it’s almost September. That’s why a girlfriend of mine and I wanted to find a place with a nice outdoor patio. I want to soak up the sun for as long as I can get it; the frozen tundra season here is too long for my Florida blood. 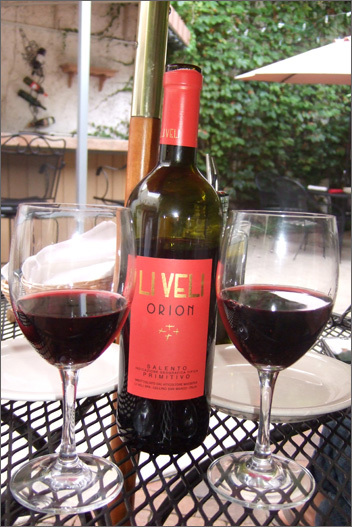 I met my friend downtown at Angelina’s, we were in a mellow mood and a vino night sounded heavenly. Angelina Restaurant is located in the middle of downtown Green Bay just off of Adams Street. There is plenty of meter street parking or if you arrive after 6PM it’s FREE. Angelina’s looks like a normal restaurant from the outside but when you step in, it’s anything but ordinary. The place is super cute. There are several tables lining the side walls with huge front windows that let in plenty of light and allow you to people watch. I do enjoy people watching but we wanted to be outside so we walked straight back to the patio. I said the inside was cute, and well, the outside patio is super cute too. The patio is enclose by brick walls with ivy growing all over to make it look like a more natural setting. There is a bar on the left side and tables all around. There wasn’t a bartender serving that bar so we sat at a table instead. The serve came over and gave us drink and food menus. I’m not going to talk about their food, (absolutely amazing) you can read Patricia’s review or better yet, go eat there yourself. Seriously, the chef has some wickedly awesome skills. Just sayin’. The drink menu consists of red wines, white wines, bubbly wines and beer. The beer bottle choices are the usual domestics you can find at most places and run under $4. As for the wines, all are available by bottle while most are available by the glass. We chose a red Syrah that was $27. Prices for a bottle of wine range from the mid 20’s to quite a bit higher. When the server came back with a different bottle than what we had ordered she quickly informed us that they were out of our choice, but the bottle in her hands was very similar in taste and flavor, it was just the next step up. She then asked us if that would be okay. Ummm, hell yeah, we’ll take an upgrade! It was a Liveli. I have never heard of that one, but then again I don’t really hear of a lot of wine brands at restaurants. I’m too cool for wine school. Later in the night when the sun was completely gone, they turned on some Italian music and some outdoor mood lighting, which totally added to the tranquil atmosphere. The patio wasn’t packed but there were plenty of tables taken. For wining and dining at Super Cute Angelina Restaurant, I would suggest making a reservation, especially on a weekend night.